We have created this Timeline, curated by Director John Abbott to tell the story of our work over the last 30 years. The Timeline is structured in several folders each representing a period in time. Each folder has a key document, and a number of supporting documents sorted by a star rating ranking their importance to the story as a whole. If you read nothing else, look at the key document for each folder first. It’s the one in the large white box for each folder. Folder 11: 2005 Can the learning species survive in schools? Folder 12: 2006 "Lost in Translation"
Folder 17: 2011 onwards What price 'Intelligence'? This symbol represents a clock, giving you an indication of how long an article takes to read. This page takes anywhere up to 15 minutes to read. An article displaying this clock would take up to 45 minutes to read. These are just averages, of course. This icon indicates an article located on an external website. Each article is rated on a scale of 1-5: this rating represents its importance to the story with 5 being most important. Recently updated An article that has been added or modified in the last two weeks. 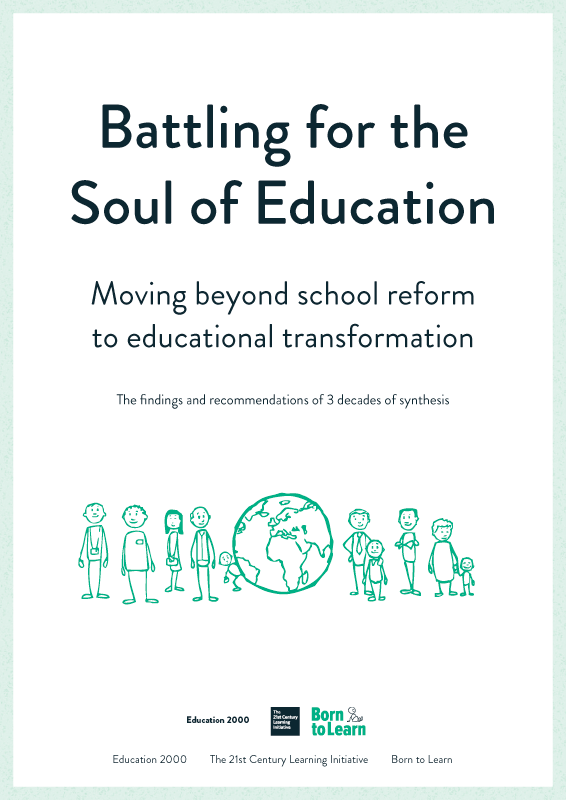 The best overview of all the issues that impact on education underpinning the Initiative’s work. A series of thoughts often shared by John Abbott when considering the difficulties of educational innovation. NATO, having grown up during the Cold War, believed that education had to be a nation’s first line of defence. To fund the Initiative applications had to be written to a variety of sponsors. A review of Robert Wright’s ‘The Moral Animal’ and Richard Holloway’s ‘Godless Morality’. Values and Ethics – Can I make a difference? Can the Learning Species fit into schools? A fascinating spontaneous piece of writing by a 16 year old user of the system. What are we Educating Children for? This was produced in the last 10 days of October 2008 as a way of popularising the issues to overcome the slowness in the publication of the book. Occasional Pieces: What Schools for What Future? Probably second only to Overschooled but Undereducated in expressing what the Initiative is about. imaginative and exciting specification for a new form of Secondary education. The following short monograph was written by Neil Richards, a Trustee of the 21st Century Learning Initiative in response to the publication of Tony Little’s book, An Intelligent Person’s Guide to Education.